The U.S.-Ukraine Business Council and the U.S.-Ukraine Foundation invite you to a roundtable discussion: Empowerment in Ukraine - Busin ess, Civil Society, Politics, Government - Women's Leadership in Ukraine. The Roundtable will feature a delegation of 15 of Ukraine's emerging women entrepreneurs in business, civil society, politics and government who are participating in week-long Leadership Program in Washington. Svitlana Salamatova , Vice President, Europe & MENA, The Institute of Cultural Affairs International (ICAI) will make a presentation about the empowerment of women in Ukraine's modern society -- doing business, building a strong and effective civil society, participating in politics and government to gain control of the levers of power to implement reforms and to build a prosperous and stable country. In addition, other members of the delegation will make comments about their experiences. Morgan Williams, President & CEO, U.S.-Ukraine Business Council, and Nadia McConnell, President, U.S.-Ukraine Foundation (USUF), will moderate the Roundable. After the opening comments there will be an open Q&A/Discussion session. RSVP: Registration is required for attendance at the "Empowerment in Ukraine" USUBC/USUF Roundtable. There is no charge for the meeting or reception. Photo ID is required. A delegation of Ukrainian women is in Washington to participate in a U.S.-Ukraine Foundation (USUF) program titled "Leadership in a Rule of Law Country." Their visit to the capital city kicked off with a March 19th reception at the Embassy of Ukraine hosted by Ambassador Valeriy Chaly. The following day the women's delegation, which includes professionals, entrepreneurs and representatives of non-profits, attended a USUF forum on Capitol Hill focusing on U.S. support for Ukraine's national security and democratic and economic development. At the event, Ambassador Kurt Volker, the U.S. Special Representative to Ukraine, and Ambassador Paula Dobriansky, former Undersecretary of State for Democracy and Global Affairs, shared their perspectives on the current situation in Ukraine and Russia's war on Ukrainian sovereignty. Ambassadors Paula Dobriansky, Kurt Volker and Valeriy Chaly at the Capitol Visitor Center (left to right). The women's delegation also got to hear from representatives of American NGOs working in the humanitarian sphere and from an expert on regional development. To view a photo album of the embassy reception and the Capitol Hill forum: CLICK HERE. At a March 20th forum at the U.S. Capitol organized by the U.S.-Ukraine Foundation (USUF), the Friends of Ukraine Network (FOUN) task forces on National Security, Economic Security, and Democracy and Civil Society presented their Priority Recommendations for U.S. Assistance to Ukraine 2019 and examined the challenges that Ukraine faces on its path to deeper integration with the Euro-Atlantic community of prosperous democracies. Nadia K. McConnell (President of USUF), and Amb. 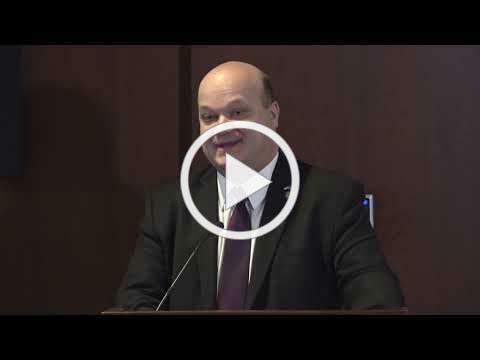 Valeriy Chaly (Ukraine's Ambassador to the USA) provided opening remarks at the March 20th forum which was attended, among others, by a women's leadership delegation from Ukraine. One of the main stories coming out of Ukraine this year will be elections, elections, elections. Presidential elections will be held on March 31, with a likely run-off between the top two vote-getters three weeks later, on April 21. Later this year, in October, Ukrainians will again go to the polls to elect a new Verkhovna Rada. These will be important national elections for charting additional necessary reforms that would enhance Ukraine's independence and democracy, drawing Ukraine closer to the Euro-Atlantic community of democratic nations and further away from a hostile, autocratic Russia. And Russia's ongoing aggression makes these elections all the more challenging. The election campaign is in full swing - vibrant, boisterous, contentious and sometimes downright nasty. (This, of course, is not a uniquely Ukrainian phenomenon.) ... CLICK to read more. Orest Deychakiwsky is the Vice Chair of the U.S.-Ukraine Foundation's Board of Directors. The Embassy of Ukraine reports that every citizen of Ukraine, who permanently resides, or is temporarily staying abroad and has reached the age of 18, may take part in the upcoming presidential election . (application is submitted personally, for free, details: https://goo.gl/WhCsnc). It is advisable to pre-verify your inclusion, as well as the correct written form of your surname, name, patronymic and the electoral address in the Voter Register. You can do this at: www.drv.gov.ua. To do this, you need to register with the "Voter's Personal Cabinet" by email or an account on one of the social networks. It is strongly recommended that you submit applications for inclusion or modification of the data in the Voter Register in advance. WARNING! There are no new voters on the polling day in the foreign polling station. Please contact the Embassy of Ukraine at 202-349-2920 (any extension #) or e-mail: cons_us@mfa.gov.ua or e-mail: Vladyslava Bondarenko (Embassy of Ukraine) <vladyslava.bondarenko@mfa.gov.ua>. The U.S. Senate's Foreign Relations Committee's Subcommittee on Europe and Regional Security Cooperation will convene a hearing entitled "Five Years After the Revolution of Dignity - Ukraine's Progress/Russia's Malign Activities." Please join the Atlantic Council's Eurasia Center for a reception. This is an opportunity to meet with other staffers working on this region and to connect with those in the think-tank community who can provide expertise and policy recommendations. We hope you can attend and look forward to connecting. Please reach out to espak@atlanticcouncil.org with any questions. Ukraine's Armed Forces were in state of deep crisis at the onset of conflict with Russia in 2014. Over the last 5 years, Ukraine has taken steps to increase the combat readiness of its Armed Forces. Despite limited resources, Ukraine has modernized its existing toolkit and introduced new equipment, including unmanned aerial vehicles (UAV), anti-tank guided missiles (ATGM), and tactical-level communications equipment designed to withstand Russian electronic warfare. These developments have chipped away at Ukraine's power disparity with Russia, but the Ukrainian armed forces still face near and medium term challenges. Mykola Bielieskov of the Kyiv-based Institute of World Policy will chart the trajectory of the Ukrainian Armed Forces since 2014, its current state, and future prospects with an eye toward Ukraine's conflict with Russia. Michael Kofman of CNA will provide an overview of Russian tactics and equipment in eastern Ukraine. Jeff Mankoff of CSIS will moderate. Join Georgetown's MA in Conflict Resolution Program and Georgetown Professionals in Russian, Eurasian and Eastern European Affairs (PREEA), for a discussion with distinguished panelists to delve into the key drivers of peace and conflict ahead of Ukraine's upcoming elections. The U.S.-Ukraine Business Council (USUBC) invites you to attend the "Invest in Ukraine - Predictability, Transparency, Property Rights" Roundtable with Yuriy Terentyev, Chairman of the Antimonopoly Committee of Ukraine. Chairman Yyuriy Terentyev will make a presentation about Investing in Ukraine..Competition, Environment, Overview including the current agenda and role of Antimonopoly Committee (AMCU) in ongoing European Integration, about the competition environment in Ukraine, public procurement system ProZorro, M&A and other critical aspects or doing business in Ukraine. The Antimonopoly Committee is one of the most powerful government committees in Ukraine and reports directly to the Parliament. This is the first time USUBC has had a meeting with the Chairman of the Antimonopoly Committee. Chairman Terentyev's presentation will be followed by a Q&A/Discussion session. Morgan Williams, President and CEO, U.S.-Ukraine Business Council will moderate a discussion. The last national census of Ukraine was conducted nearly 20 years ago. Recent attempts to conduct a new census since have been postponed. Complicating the issue, events in Ukraine such as Russia's annexation of Crimea and the war in the East have led to dramatic demographic changes that remain unaccounted for in official statistics. Professor Ella Libanova, Director of the Ptoukha Institute for Demography and Social Studies of National Academy of Sciences of Ukraine, will offer an analysis of Ukraine's current demographic situation as well as predictions for where the country's demography is headed on the eve of the 2019 presidential election. This event will be in Ukrainian with English translation.